I visited T&T Supermarket recently after I found myself up at Promenade Circle, a fair way's out of my usual neighbourhoods. Promenade is close enough to us, but it's past Steeles Avenue, so anyone in the Toronto area will know that it therefore costs twice as much each way to get there on the bus. If you're feeling energetic, though, you can walk from Steeles, and that's just what we did. Admittedly, I've been burned by Kirin before. As I mentioned in in my previous post about milk tea, I find Kirin's traditional blend to be overly cloying. Other people frequently say it is the perfect sweetness level, but I can't handle it, and I didn't have any better luck with Kirin Afternoon Tea Milk Tea Special, the only other version sold here in Toronto. That one is made from Assam tea, but still no dice. The 1/2 calorie Kirin might work for me, but I haven't found it here. 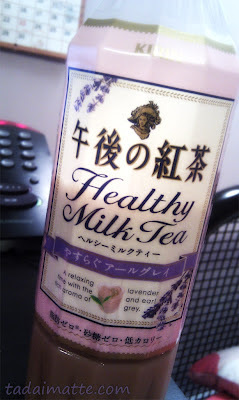 So I wasn't getting my hopes too high for "Healthy Milk Tea, Yasuragu Earl Grey," but the promise on the bottle of lavender and earl grey (this was my favourite Starbucks latte flavour in Japan) wooed me. At $2.99, much cheaper than my imported Kochakaden, I took home a bottle and hoped for the best. I took it home and kept it in the fridge for a few days, waiting for the right time. Per 100ml, this stuff is just 12 calories and no sugar - I supposed that would be why it's marketed as 'healthy.' Sweeteners abound! This Earl Grey/lavender variant is obviously based on the regular Kirin Healthy no-sugar version that I have yet to see around Toronto, and is imported by Uncle T Food in Richmond. It is almost as good as Kochakaden and much better than Kirin's standard blend! I am very pleased. And given how ridiculously fattening standard milk tea is, I think this is a very acceptable substitute while I am hoarding my limited stash of Kocha. Sadly, with my luck, it's not going to stay on the shelves for long...special-flavour products fly off the shelves in Japan. Soon, I'm sure I'll be mourning Kirin Healthy Milk Tea Lavender Earl Grey alongside all those other wonderful seasonal flavours. Until then...I think I need another trip to T&T.